Val Westen, who just got her private pilot’s certificate in December 2017, is on the move. 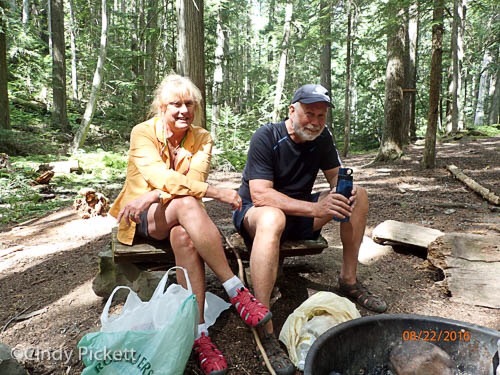 She and her partner, Dan, are planning a real cross-country flight this summer from their home in Northern California to see grandchildren in Massachusetts, children in Pennsylvania and Massachusetts, friends and other family in Illinois, Michigan and parts as yet unknown. The plannning part is great to consider and fun to think about. Dan is doing a lot of the plannning while Val is busy transitioning to a bigger and faster plane. 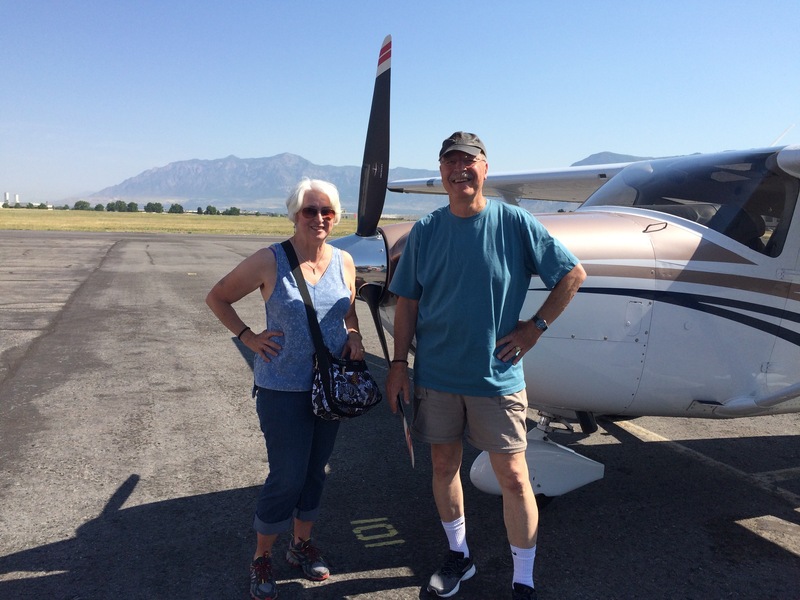 Val trained on a Cessna 172M and loved its cozy feel, its 6-pack instruments and its great additions, like GPS. It was 160 horsepower, and like baby bear’s porridge, it was just right. But she and Dan will be flying a Cessna T182T for the summer trip, and its 235 horse power and heftier weight means more time with a flight instructor. So far, so great, Val reports. She hopes to have her endorsement for the 182 within the month. As her daughter always reminds her, the sky’s the limit. She’ll report in from the trip when she can. The amazing thing is she can’t stop smiling, except of course, when she’s sitting in the left seat (in this picture) and then she’s all business. When I retired from being a lawyer, I jumped right into becoming a pilot. It was a longer and more arduous commitment than I anticipated. But the rewards have been enormous. My mind has sometimes complained about the incredible amounts of data I keep cramming into it—weather, terrain, airspace, the aerodynamics of flight, and myriad other things. But it’s a great retirement gig because it keeps your mind agile and challenged, all the time. Plus, you have all kinds of fun flying a plane and you discover all kinds of new friends who love to fly. I recently flew to Texas in a Cessna with my partner, Dan, who is a private pilot and was going to a course for his Instrument Flight Rules rating. It was an unforgettable few days in the air. From California, already a wonderful place to be, we stopped our first night in Sedona, Arizona. This place (see the pictures of a long runway on top of a butte and the red cliffs all around) had been on my bucket list for years. Now having been there and experienced its serenity and beauty, it’s on my every-other-year list, at a minimum. I want to go back to hike and to visit the vortices, thingswe didn’t have time to do on this trip. On the second day, we flew over huge numbers of crop circles and landed in Roswell, New Mexico for lunch. There were no UFOS (although I kept looking) but there was a rather eerie sight at the airport itself. The runways were so long that you couldn’t see the other end as you landed. And when we taxied to the FBO, I realized that the long runways were part of the reason that Roswell has become an airplane storage area. There were hundreds, maybe thousands, of big planes (747s, 737s, Airbusses of various numbers) parked nose to nose in long, neat rows. I was so amazed I forgot to take pictures. I learned that Roswell is a “parking place” for planes no longer in service. Huge numbers of huge planes. Sometimes theparts, the engines and other things are repurposed, so there are all those planes, waiting for their next incarnation. At first, I was sad because they’re no longer flying. But then, when I imagined the places they had flown and the people who flew to exotic places in them, I smiled and went to lunch. On to San Angelo, Texas for that second nightwhere the people were friendly and open and the temperature was hot. Our third day took us to Austin Executive Airport, just outside Austin. The view going into Texas was fleecy, popcorn clouds in the distance, and wide open space. I loved the pattern of shadows the clouds made on the ground as we flew. Fortunately, we never caught the clouds and landed at Austin Exec in time to meet family for dinner in Austin at Searsucker, awesome for the great andunusual margaritas they offer. If I were to judge the days by the number of margaritas at day’s end, a two-margarita day was just about perfect. And so far, each day had been a two-margarita day, figuratively if not actually. The sweetest reward was getting to each new place in a small plane. I flew home commercial–much faster, but way less fun. Dan stayed to complete his course and obtain his IFR rating. I hope for many more, longer and more complicated trips in our future, when I get my certificate and we launch across country to visit more family and see exciting places as only they can be seen by flying into small airports in a single-engine plane. ​You hear it often. Texas wants to wrap their big ole arms around you. Our last flight 15 years ago across the ‘Hook Em’ state felt like hours of nothingness. Only fields of oil wells pumping out their black gold informed one of progress. Yet our route on July 14th followed an ancient trail, following rivers and terrain. Long before westerners envisioned the ‘El Dorado’ native peoples were engaged in a constant migration. Whether it was weather related, trade motivated or territorial the Chama River drainage connected the lower Southwest (think Gulf of Mexico) up the Rio Grande, San Antonio, Pecos, Dolores, San Juan to the Colorado River and canyonlands of the Southwest. The crossroads was Chaco, an ancient seat of authority. The ruins of Chaco represent a knowledge and civilization every bit as powerful and sophisticated as ruins throughout Central and South America. In the 1700s Spanish interests pushed out of Mexico in search for gold. They too used these routes as an overland trading highway that wrapped up into Utah, forded the Colorado River at Moab, then turned westward to California. Along the way the Spaniards would be trading, building missions and converting indigenous people to their Catholicism. 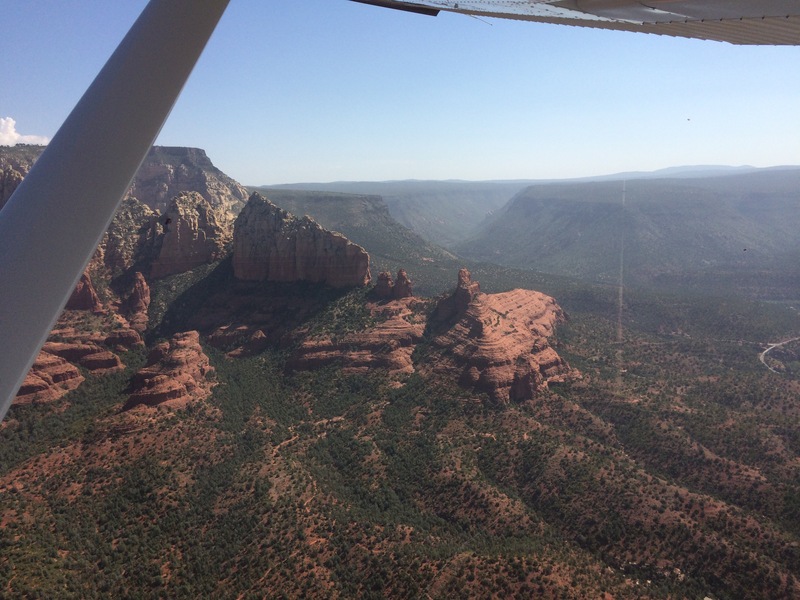 ​Our flight out of Canyonlands (CNY) began with a brisk climb to 13.5K’ wrapping around the La Sal Mountains. You’re quickly in Colorado passing the San Juan Mountains, across the high mesas of New Mexico, Pecos Wilderness, over Santa Fe and then down river drainages and the flat plains of Texas. It was my longest flight, almost 6 hours non stop. At 13.5K’ the fuel burn is reduced and you really get an extension in range. Skies were clear/scattered till the last hour. Then the moisture off the Gulf was moving in and up. Thunder storms were massing and the scattered layer went to broken. At this time the choice was to get below the rapidly building layers and bump along underneath, dodging cells, restricted areas and towers or hope for clear weather ahead. We descended with only a few bumps off the ceiling. ​Our destination for the 99s International conference was Stinson Municipal Airport in SanAntonio. 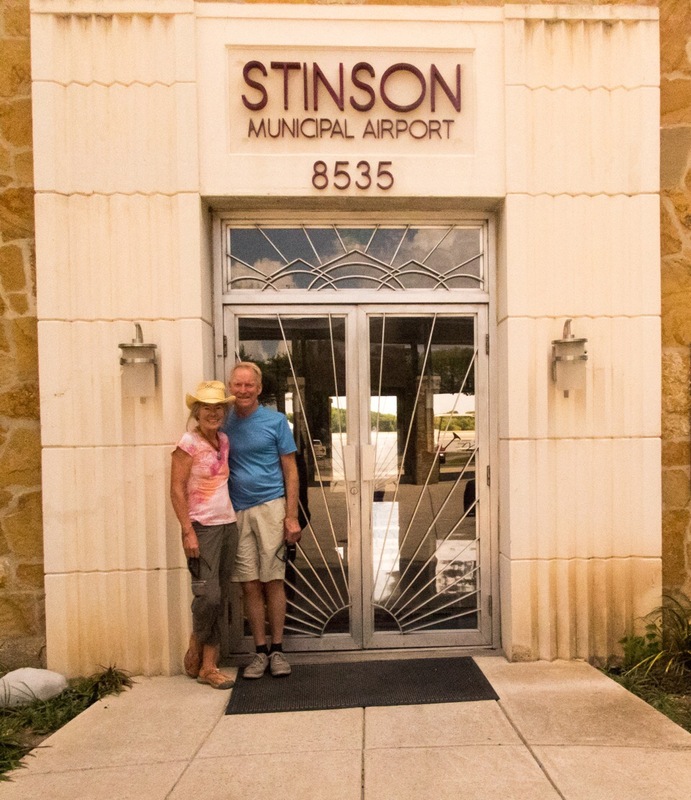 Founded in the early 1900’s Stinson is the second oldest continuously operating general aviation airport in our country. It’s history is is built on daring young women and men whose dreams of flying the South Texas skies came to life. The airport is named in honor and in memory of an entire family of early aviation pioneers. The airport and terminal are gorgeous, reflective of a recent renovation of it’s New Deal era terminal building. The “howdy ya all’ was a welcome clearance to land. ​The city of San Antonio is blessed with breezes coming up off the Gulf along the San Antonio River, one of the oldest settlements in Texas with three missions and a vibrant down town. Much of the older section of San Antonio has been redressed. Beautiful, old, golden stone buildings, built in the early 1900s have been restored, a river walk lush with vegetation provides a social center for hotels and restaurants. (A little too much Disneyland for my tastes). Warehouse, industrial districts, have been caught up in the millenial enthusiasm for breweries, trendy apartments and shops. An excellent transportation system, with the best air conditioning, will get you just about anywhere. The Alamo is front and center a must see to understand the Texas pride and culture. 57 defenders of this small fort stood in the firing range of 5,000 Mexican troops and perished. If ever there was a legacy the martyrs of the Alamo lives on. Volunteers who staff the park are always eager to describe the lives and battle of the Alamo. You can’t help but be impressed by their dedication and enthusiasm. For most of the year flying in CA is some of the best in our country. Winter provides excellent crystal flying along the coast, spring, summer and fall always yearning for a fly out. And then there’s the ‘fire season’. Sadly the entire state was filled up to 12K’ with dreary, stinky, stifling smoke. The brown veneer of CA’s forest conflagration kept us climbing to 13.5K’ where we could skim along the top of the muck. Lassen passed by unnoticed, Shasta barely poking through. What a horrible and tragic waste of resources. 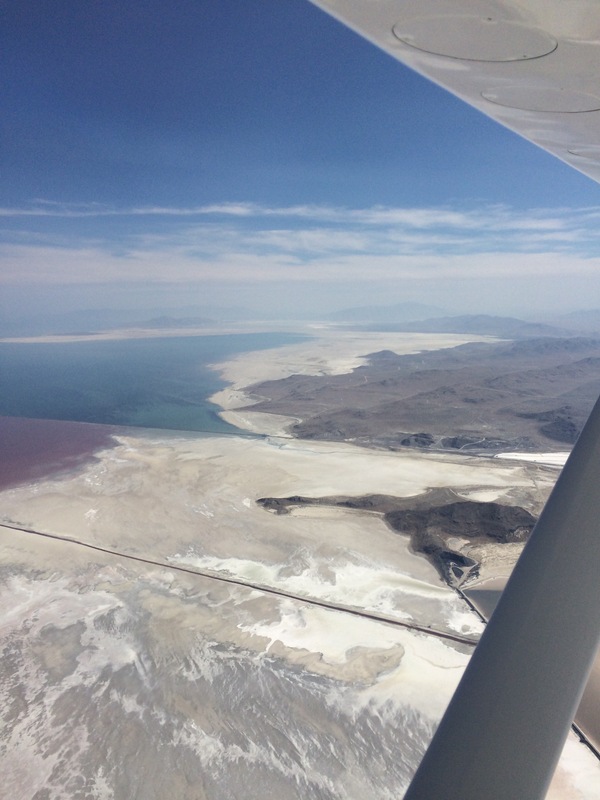 Once clear of the Sierras and Siskiyou ranges we flew into the zone of southern Oregon’s alkali lake region where vis was more generous. It’s an odd and empty landscape broken by errant mountain ranges, a few hay farms and a scenery better suited to the moon. Flying north you enter into the northern continental influences; rivers, mountains, lakes and dense forests. Towns are connected by long stretches of lonely roads undulating around mountain range and river drainage. There really is lots for the eye and mind to seek. 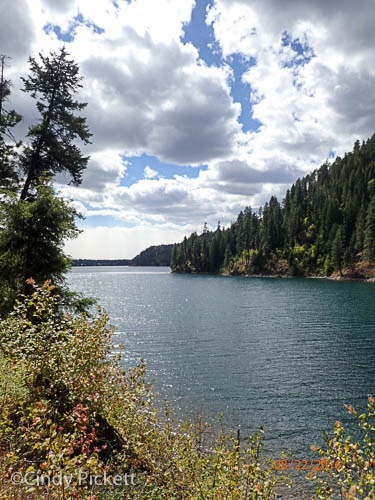 Pend Oreille, Coeur d’Alene a salute to French fur trappers who left their homelands in the 1700’s. Pretty country from the air! Flying home reaffirmed how very beautiful our western lands are. Never hesitate, never ignore the opportunity to fly true north. Great friends, great fun, great flying. Often overlooked in our carousel of life are those small corners, the exits on the highway that don’t light up, the pixels that blend in and get lost on an ever increasing panorama. There is a wealth of culture, history and signifiant worth in the places that don’t command center stage. Our theme for fly outs this year are to discover, through flight, the log books of our past. Small town America, with the help of countless volunteer hours, have built museums documenting their heritage. Often overlooked, sometimes so rural that they disappear into boxes stored in attics, are the momentos that reinforce our being in this life we live. Museums are the work of righteous belief and an act of faith. They reflect the collections, interests and inquisitive adventures of local citizens. If we are ever to move forward in our lives it’s through the lessons of the past. Saturday Feb. 27th woke to a flurry of e-mails from our group of 6 pilots detailing all the alternatives of a winter flight. Go-no-go, early departures, home early before wx returns, late lift off, quick turn around were all discussed. What we settled into is that you can’t push the wx, only row between it’s banks. Our destination was Chandler Field, Fresno, CA and the Fresno Art Museum. Chandler has a particular sweet spot in my heart because it was here,in 1940 that my dad soloed. He always described it as a farm strip. I had never been there. Lucky for us the WX sorted itself out quicker than the briefers expected. We had clear skies by 9 am. Better yet, the notorious central valley fog burned off early. Carolyn Walker and Meaghan Bertram copiloted my plane. Susan Royce and Nysa Kline flew with our newest member Leanne Anderson out of Gnoss Field. Time enroute was a quick hour of incredible springtime CA. Massive poppy fields graced hillsides, orchards all up and down the valley looked like a cotillion of fancy dresses. Rivers, wetlands and creeks were in full saturation. It was just one “wow” after another. The real jewell in the flight crown was Chandler Field. Built in the late 1930’s the terminal is an art deco palace exquisitely restored. Waiting rooms, powder rooms, the ‘gents’ room, ticket counters, luggage, hat boxes, light fixtures and ceiling fans remind one of a time when flying was a glamorous, exotic and romantic means of travel. It reflected California’s brilliant minds (think Howard Hughes) who dreamed of a world connected by flight. If nothing else, when in the area, take a moment to fall out of the sky and check it out. Museum #1: We ‘Ubered’ a ride into Fresno to the Fresno Art Museum. By now the pilots have a terrible rumble in the stomach jungle. So museum #2; an old Italian Deli one block over from the museum. There must have been a line up of 30 people, with their ticket pinched between hungry fingers, waiting to place their order. This was the real deal when delis had smoked meats hanging from the ceiling, cheese wheels stacked and every conceivable accoutrement of sandwich and salad to choose from. It took a half hour to get our orders but well spent wandering the aisles. The Fresno Art Museum has a sculpture garden decked out with tables and chairs just begging for picnics to visit. Finally on to the main attraction, museum #3. The FAM was sponsoring a collection of photographs by Nicholas Murray. Murray was in the right place, (Mexico City), at the right time, (Diego Rivera and Frida Kahlo) to document the life of the times. Even though the images have been digitally reproduced they retain the color values of early color photography. Frida and Diego’s lives flowed between Mexico City, Paris and New York. Murray, one of Frida’s many lovers, captured the souls of an era of creative genius. The museum also has 5 other galleries of Meso American art, (imagine some of the best sculpture and pottery you’ve ever seen), a salon of the ‘Promised Land”/ paintings of immigrant farm labor, a fantasy wonderland exhibit of wild and bizarre art and several other rooms we didn’t have time for. By now the clock is ticking and we need to get aloft before the light window closes. Meaghan and Carolyn, my copilots, kept the plane on a direct course with hardly an altitude waver. Better than an auto pilot! Saturday evening back, at O69, with the first warm wx of the year and hangers were open with projects airing out and local pilots volunteering their time to restore our own terminal. Not quite art deco but a much needed improvement. Thanks guys for all your hard work. What a great, beautiful and learning day! Great friends, great fun, great flying! Our Jan. 31st fly out to San Martin was hedged by some serious winds that kept us on the ground. Good choice, your options are severely limited once you launch into the tumbler. In spite of the disappointment I start scrambling for ‘Plan B’. This is the ‘ole ace up the sleeve moment. It becomes a challenge to find a great alternative to fill the adventure need.The following weekend, Super Bowl weekend, was the perfect collection of sunshine, windless, and warm. On top of that most of America was glued to their layered dips, chips and endless supply of beverages. Perfect! The skies would be empty! Winter is THE time to fly to coastal offerings. None of the wind, fog, blowing sand to contend with. And we are so blessed with beach destinations that have airports. 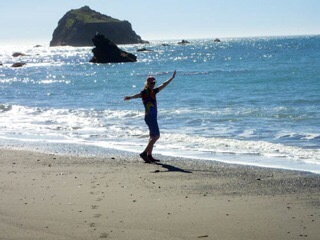 Our ‘go to’ ace is Little River and adjacent Mendocino. Contrary to the reports there was an obnoxious thumping at 4,500’ coming out of the east. Leaving O69 we headed out to the coastal waters where the knocking relaxed and our eyes didn’t bounce around. And what a glorious feast to gaze upon! Grassy, green slopes cascade to rocky benches, waves trailing in from distant Pacific shores, and a few puffy clouds to define an otherwise pristine sky. Going north along the coast is an easy 45* entry to runway 29. Little River now has an awos frequency, 121.125, that takes out a lot of the guess work we used to go through before. The plan was to hike over to the Pygmy Forest and down as far as we wanted for a picnic in Van Damm State Park. But as we were tying down a van drove up and offered us a ride into town. Yipee! Toes in the sand of the Little River beach in just minutes. It makes one dance in the waves with happiness. There were a few divers paddling around in the bay. Other than that we had the beach to ourselves. Just across the road is the entrance to Van Damm State Park and the Fern Trail that follows the Little River up the canyon. From warm, toasty beach to dark, mystic, mossy forest is a chilly change. 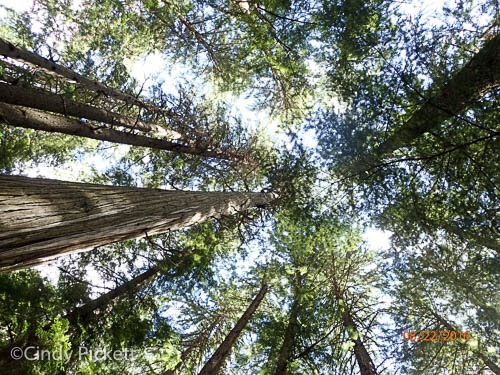 We picked up the pace to generate some heat and immersed ourselves in the redwood forest. I always look for some dinosaur hiding around the huge trees; it’s such a primordial place! The river was flowing with this winter’s abundant rain and the ground was a soft, quiet trail of amidst the giants. From the back of the canyon you then traverse a ridge up to the warmer slopes of the Pygmy Forest. Altogether about a 5 mile hike back to the airport. An equally magic flight brought us back to O69 and an entry in the logbook of a beautiful flight and day. Great friends, great fun, great flying! Loss of control is the biggest cause of accidents, usually fatal, in general aviation. Wonder why? maybe pilots are missing some basic stick and rudder skills in their primary training. How many pilots know that the elevator is the primary control that makes an airplane turn, not the rudder and not the ailerons. How many pilots have done a spin? how many pilots are afraid to spin? How many pilots know that stalls don’t cause spins? And, not knowing is how pilots kill themselves by spinning in on the base to final turn, or otherwise losing control of their airplane and unintentionally meeting up with terra firma. Those are some of things I learned recently when I took an Emergency Maneuvering Course (or “loss of control”) course last week in Reno with Tim Brill, certified aerobatic instructor, and disciple of Rich Stowell, the acknowledged expert on spins and loss of control (Rich has done over 30,000 spins), that I want to tell you about and recommend you all take. The course is at Stead Airport in Reno where the Air Races are held, and you fly in a aerobatic Super Decathlon. The Decathlon is a tandem seating, tail dragger rated to 6 positive and 3 negative G’s. Tim’s school has an “aerobatic box” right over the Stead airfield for the training. 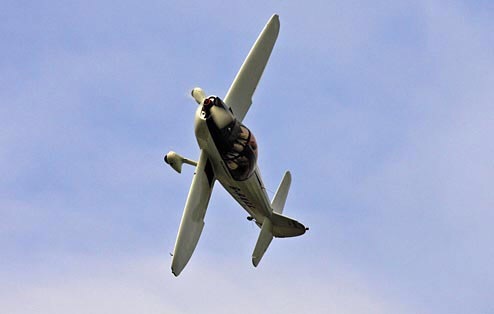 Tim’s program is patterned after Rich Stowell’s work, and check out either RichStowell’s or Tim Brill’s Aerobatic School websites for more detail on the curriculum and their training philosophy. So, here’s how it went: Sunday: Drove up to Reno at four in the morning and started Sunday morning meeting with Tim who put me at ease telling me he was one of Rich Stowell’s most nervous students and no worries that I was a tad anxious about spinning airplanes. Tim thoroughly reviewed what we would be doing during the flight. On this first flight Tim put me in the back seat of the Decathlon, went over all over all the controls with me and off we went. First things first, Tim had to show me how to properly turn an airplane and convince me that it’s the elevator that makes the turn not the aileron or rudder – set the bank with ailerons and rudder – bring controls to neutral – STOP – breath, and then pull the elevator to execute the turn. Don’t believe it? after all a turn is just a loop (no aileron or rudder) laid on it side! The flight lasted .7 hour and also covered basic flight principals finished with some spins with me on dual controls. It was so strange to see the earth spiraling towards you. The clouds came in the rest of the day so did not get a second flight in. Tuesday: Tim put me in the back of the Decathlon again so he could really show me to feel the yaw and roll created by the ailerons and rudder and to look at the wings. It’s the yaw/roll that causes spins, not stalls! Two flights, and I got to fly the maneuvers. Wednesday: Back in the front seat of the Decathlon. More spins and just having fun and did aileron rolls and loops. Aileron rolls teach you how to recover properly from an unexpected upset like wind shear or wake turbulence. Loops are fun, but little harder on the body. Those G forces! *Special thanks to Mark H Potter II for his help with this article. ​Most of us face those big reunions (ones ending with a “0”) with a mixture of happy anticipation and anxiety. Dan Bedford and I certainly did as we headed off to Estes Park, Colorado in June 2015 for his 50th Germany group reunion. I was looking forward to meeting people I had only heard about and he was looking forward to seeing them again. As it turned out, however, the real excitement was ours alone, since we planned to get from Gnoss Field in California to Fort Collins, Colorado by flying ourselves there. This was our first big trip outside California in Dan’s plane, Peregrine. Peregrine is a Cessna T182T, which can take us up to 20,000 feet, enough to get us over the Sierra Nevada and the Rockies. ​Our flights were magical. We were lucky and our weather was clear and beautiful, so no delays for weather. 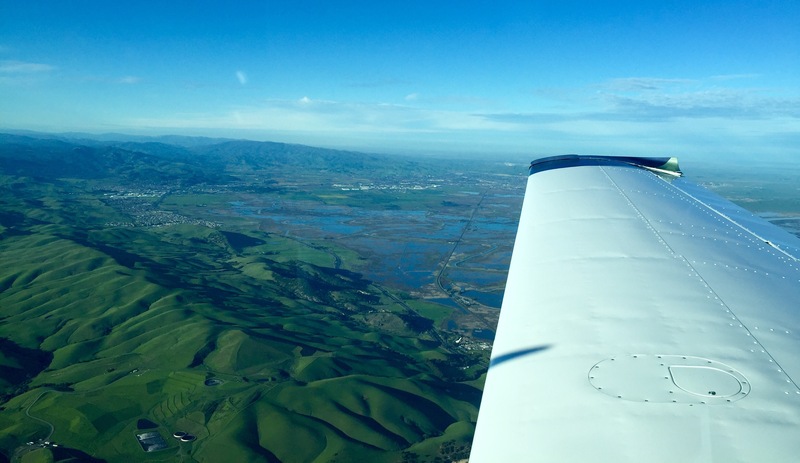 The first day’s flight took us from Gnoss, over the Central Valley, up over the Sierras. Lake Tahoe was sparkling blue and hints of snow remained on isolated peaks. We were too busy flying to take pictures, but you can take our word for it that it was spectacular. 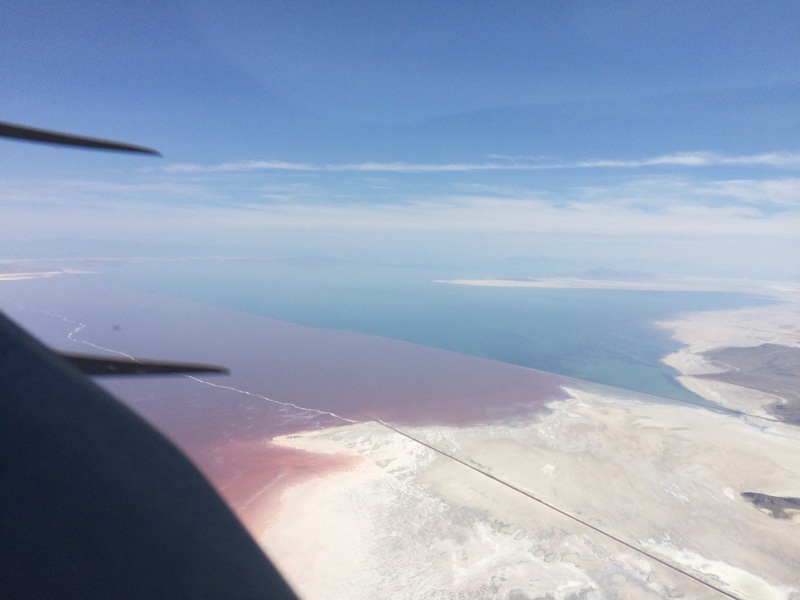 ​As we left Utah and flew over southern Wyoming, we were surprised to find ourselves almost directly over the Greater Green River Intergalactic Spaceport (airport designator 48U). Yes, that’s a real airport found on the Salt Lake City Sectional just west of Rock Springs-Sweetwater airport (KRKS). I would love to know the back story of the Spaceport, at 7,182 feet, like who first landed there and how it got its name! ​We pressed on, turning south into Colorado, and easily finding our way directly to Ft. Collins/Loveland, the GA airport closest to our destination in Estes Park, where we left Peregrine in a huge hanger with other bigger planes to socialize and rest up for the trip home five days later. Flying is my tide, it threads my life with the constant surge of it’s incoming energy and outgoing thrill. At times it will be a tempest rocking my shores, mashing on my sense of sensibility. Other moments I bask in the mill pond of a sweet and silken sky. Pulling, pushing, drawing me on through a winged life. It had been three months since I leaned out the window and yelled “prop clear”. Our mechanic put down the law and said leaving the plane out on the ramp in Moab is a recipe for disaster. The massive blows that can strafe the desert are especially cruel to a plane tied out. There aren’t any hangers for rent at Canyonlands. In previous years we ended up checking for damage control after some of the big spring winds and sand storms. I imagined the plane missed us, hibernating in the hanger at O69. First day back I headed up to the airport to get some landings in, steep turns, maneuvers and try to remember where everything was located on the panel. Not to mention getting my ‘flow’ going again. Twice before we had tried to fly out to the San Juan Islands. Only to be defeated by their ever present weather that has no protocol for season or aviation. When we found out about the ‘heat wave’ in the northwest both of us eagerly jumped to the forecasts for the next week. Seattle was suffering 85* days with clear skies and unlimited vis. It didn’t take long to find a place to stay, pack the bikes in the plane and become friends with the weather briefers. Nice thing about Petaluma’s morning fog… it makes for a civil, leisurely breakfast before taking off for the airport. 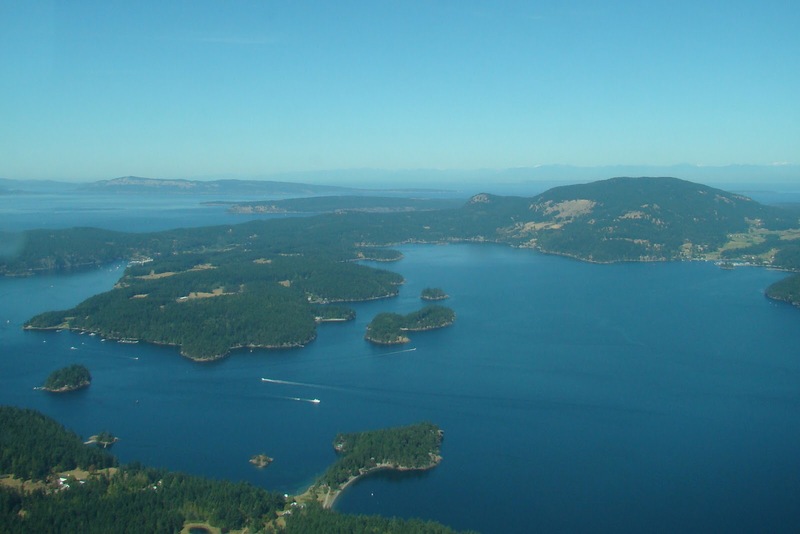 Our flight was direct: O69-Redding-Medford-Portland-Olympia-Whitby Is-Friday Harbor. We stopped for fuel at Scappoose, OR. (The scene of a previous failed attempt to get out to the islands) There was a little bit of sashay around some building clouds, but otherwise a crystalline flight. Flight time was 4 hours; enough to get familiar with the plane and her sounds again. Friday Harbor was a hoot; crazy crosswinds that had everyone clinging to landings you don’t want to redo. The next three days were spent immersed in the marine life of land floating on the north western edges of America’s continent. The bikes were perfect for getting around, it’s a rather small island. There are also these cute motor trikes you can rent that looked like people were at Disneyland again. Food was delicious, crab, salmon, prawns, halibut in abundance with lots of local produce. Good lattes in the mornings to go with all sorts of bakery goods. All day there are ferries plying the islands and it’s free for walk on or bicyclists to sail to Orcas, Shaw or Lopez Islands. Kayaks are ever ready to rent, Orcas are out in abundance and always a pretty spot to sit and watch the ocean go by. If ever one needed a sense of summer, this was the spot. Back to the mainland and Aurora airport just south of Portland. Don had read about some new mountain biking trails in Sandy, OR, just east of Portland. Always ready for adventure we rented a car, transferred the bikes and off we went for more fun. Different kind of riding from that of Moab. Lots of shade in dense forests, tree roots, steep narrow shoots between trees and loose dirt. So hot it took a few beers to finally cool off. Our favorite Uncle Ray and wife Evelyn live in Canby, close by, and we had two great days catching up with them. Flying south once again, escorted by the massive peaks of Adams, Rainier, Bachelor, Hood, Sisters, and Diamond peaks. The Cascades were awash in summer’s smoke drifting south from Canada. The ridges and canyons seemed like blue, gray waves rising to the Cascade summits. Mt. Shasta had it’s ever present tail of turbulence and cloud train, dominating the border of CA and OR. Our own Coastal Range, the popcorn machine, was tossing cumulus buildups into the sky, taking the summer heat and generating thunder storms later in the day. All the while we could sit back and watch the activity without being caught in it. Monday at O69 was quiet, a nice time to come back from a trip. So yes I am afloat in my tide once more. Nice to be home in the sky. Great friends, great fun, great flying!